Imagine a world where supercomputers programmed by totalitarian technocrats make virtually every important decision for you, in addition to manipulating you at every turn. Such a dystopian future for the world may not be that far off — at least if humanity continues on its current course. And the technocrats behind the plan are barely even bothering to conceal their agenda at this point. Now, the UN is even seeking to hire an “Artificial Intelligence Advisor” to help weaponize emerging technologies and AI to advance its totalitarian UN “Agenda 2030” and the so-called “Sustainable Development Goals” (SDGs) at the center of it. At the same time, the potential threat posed by AI is being cited as a pretext to further empower the UN to create global “laws” and regulations. And unsurprisingly, when the dangers of AI were mentioned, it was almost always in the context of empowering transnational institutions to “deal” with them by further empowering government and globalists. A recent UN summit reiterated again that the world is quickly moving toward what experts refer to as “technocracy,” though that word is rarely used by its proponents or their useful idiots today. As the agenda becomes clearer, warnings are growing that freedom and self-government may not survive, at least if humanity does not restrain the forces seeking to use AI and technology to undermine them. But the battle is only just getting started. Telecommunications Union (ITU). The controversial agency, which is at the forefront of UN efforts to censor and tax the Internet, is run by Chinese Communist Houlin Zhao, who in 2014 expressed publicly his belief that censorship was in the eye of the beholder. Other UN agencies run by known communist agents were listed as partners, too, and other Chinese Communist agents in the UN and beyond were deeply involved. The summit, he said, would help produce a common understanding of how emerging technologies — and AI in particular — can be used to advance Agenda 2030. 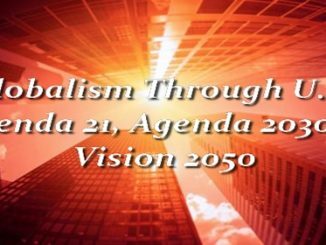 The radical “masterplan for humanity” or “Declaration of Interdependence,” as UN leaders have called the UN plan, involves national and international wealth redistribution, full-blown global governance, government control of production and resources, a surrender of liberty and national sovereignty, global indoctrination of children, and much more. Unsurprisingly, the mass-murdering regime ruling Communist China boasted openly of its “crucial role” in developing the extreme UN Agenda. On “poverty,” for example, the ITU said AI would “provide real-time resource allocation through satellite mapping and data analysis of poverty.” So now, instead of central planners allocating resources, computers programmed by central planners will do so — almost certainly with similar results. AI and “Big Data analysis” can also be used for “targeted interventions” in the lives of children via “education,” which Agenda 2030 promises to use as a tool for indoctrinating children into becoming “critical agents of change” supporting the UN’s agenda. The schemes will also be used for “identifying and correcting for gender bias,” tracking fishermen and hunters, reducing “discrimination,” and more. And that is just the start. “The AI of Everything, the digital AI mesh, fed by the ubiquitous IoT [Internet of Things], smart devices, and wearables, is already impacting smart cities and helping to create sustainable communities,” the UN ITU blog continued. “AI is yielding optimal consumption and production levels with vertical green farms, eliminating waste, and vastly improving yields and resource efficiency.” Again, if that sounds like technologically enhanced Marxism and central planning, good — because that is, essentially, what it is. But there are also “serious challenges” and “ethical issues” at stake, he said, pointing to the dictators’ club he runs as the “universal platform for discussion” to help manage the transition to the brave new world. “Together, let us make sure we use Artificial Intelligence to enhance human dignity and serve the global good,” he added. Of course, as a longtime Socialist leader — including a stint running a global alliance of socialist and communist parties, many with the blood of countless innocents on their hands — Guterres’ vision of the “global good” is likely very different than the view of Christians, Americans, conservatives, free-market supporters, advocates of liberty, and countless others. Another, smaller UN confab on AI was held earlier this year. As reported by UN supporter Peter Bendor-Samuel in early May, the UN Office for Project Services (UNOPS), which implements UN schemes, hosted a summit examining the security implications of AI. “The meeting was hosted by UNOPS with a view to consider how AI can be better deployed to support the UN mission,” he wrote, noting that attendees included “leaders for companies such as Facebook, Google, IBM Watson, Intel and IPSoft, along with government entities and distinguished academics and journalists.” In short, the summit appears to have been aimed at the eventual development of global “rules” on AI that would serve the UN agenda. When combined with other troubling developments and trends around the world — the establishment push for a cashless society, the Communist Chinese regime’s Orwellian “Sesame Credit” scheme to rank all of its victims based on their slavishness, the emergence of “smart cities,” the exploitation of Big Data by governments for tyranny, constant warrantless surveillance, extreme data-gathering and -mining deployed against children, and more — it is clear that humanity is at a dangerous crossroads. If the totalitarian-minded globalist establishment behind the UN wins, humanity will be condemned to a future of high-tech worldwide oppression that would make George Orwell and Aldous Huxley blush. But if humanity wins, the technology could certainly be used for good. Freedom-loving, God-fearing Americans must get involved in the fight to preserve the Constitution and American independence — before it is too late. The alternative is a totalitarian global system of technocracy run by the UN and its globalist, Islamist, socialist, communist, and corrupt member regimes, with unfathomably dangerous technology at its disposal. And that should be considered unacceptable by all sensible people. The simplest way to prevent such an Orwellian nightmare is for the U.S. government to withdraw from the UN using the American Sovereignty Restoration Act (H.R. 193). All that is needed now is enough public pressure on Congress. Alex Newman, a foreign correspondent for The New American, is normally based in Europe. He can be reached at anewman@thenewamerican.com. Follow him on Twitter @ALEXNEWMAN_JOU or on Facebook. Why is this incredible story not being picked up by Infowars, Drudge, Breitbart, WND and the rest of the alternative media??? This is HUGE! Thanks TLB for reposting.